Has it been a week already? Graduation day! We ask a LOT of our graduates. We throw SO much information at them in 7 days - and we really do expect them to read, listen, ask... until they have a really good grasp of Steemit! We promise not to be too far away after that 7 day mark. Cuz.... come on, there is still a LOT to learn! But when they can get MOST of it - they graduate! Congratulations Darren! It seriously went so fast! But we're glad that you're still close...(you will stick sorta close, won't you? we need giggles. We also need to know where the alley art is located. please!!) We're proud of the work you did this week - even with your crazy schedule! Means a lot to us that you worked so hard! Welcome to the Wagon, Grad! We liked him from the very first moment. 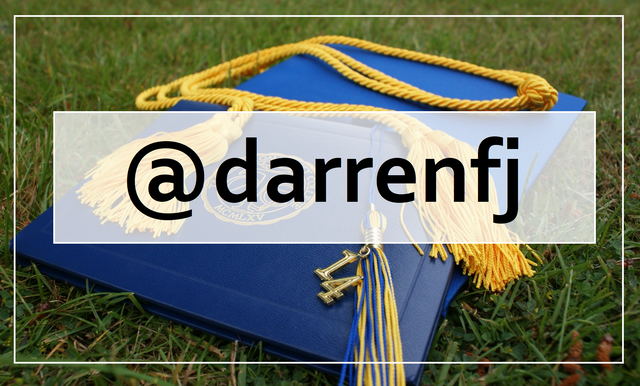 Congratulations on your graduation @darrenfj! ..the week went by fast and this second week flew by too! You are all so friendly and gracious with your time. It is muchly appreciated.. Honestly reminds me of the interwebs when it was all BBS's and 4 hour downloads..